Double Release Mechanism is used for “close-open-close” operation of Plankton Nets or miscellaneous flotation packages and water collection devices. The unit attaches to the hydro-wire by two quick release pins. It is held in place and swivels freely around Model 1500-WS Wire Stop. 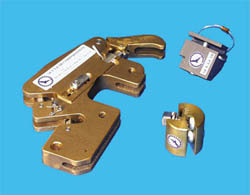 Release levers are activated through deployment of Model 1500-91B Brass Button Messenger. All accept up to .79 cm (5/16”) cable. Serial operation is a standard feature of the Double Release Mechanism. Model 1500-SB Snapper Block attaches to the Plankton Net Mouth Ring and secures the rolled net to the hydro-wire till messenger activation.